Hi mate. Yes I think it can seem quiet, I've heard people complain about the same thing before. I think the problem is that it's mid scooped anyway which doesn't help with perceived volume, and there are losses caused by the tone stack. I believe a useful mod for this is to take a feed from Fuzz lug 1 to a SPST switch, and the other side of the switch going to Volume 3 (all other wiring remains intact). This bypasses the scooping (and signal diminishing) tone stack and sounds very good in its own right by all accounts. Awesome, I'll try that then buddy, thanks Mark. I just made this one and it works. My question though is, why can't I almost hear the difference between min and max on the fuzz knob? Hi, The fuzz knob doesn't adjust the amount of fuzz, it just changes the 'flavour'. If that makes any sense. Try any NPN silicon that you have, 2N3904 or 2N5088 may be decent common alternatives (they'll need rotating 180 degrees to those shown in the layout). General Guitar Gadgets does sell a kit for this, but theirs has what I think is an output boost. It uses a 2N3904, that's all I remember. It might be worth it to slap a mini booster in the box! Aside, the FY-2 is really nasty. Not exactly the fuzz I want for bass, but a good option. Hi, have finished my fuzzrong clone, with help from Ivlark Cheers! I love it, and want to do the shin-ie next. Unfortunately I cant source 3n caps from my usual suppliers. I have 2n2 or 3n3s would either of these be an ok substitute? Everytime I've tried to buy 3n I ended up receiving 3n3 so that seems to be the closest thing in current production and is what I would use. I seem to have solved this problem simply by the connecting wires together instead of to the the footswitch,bypass restored! Cheers Pete. Hey guys. making this for a friend, am in need of a little help. got some 3904's measured at around 190 hfe in there and im still not getting ANY gain, the circuit seem to work and so does the volume but the fuzz knob does nothing. Have tried lots of trans in there and the only ones that make any noise are barely fuzzing atall. figure it could be a solder bridge or something. the only values I have changed are the 3n for 3n3 cap and the 1M2 resistor for a 1M as thats the closest I have. thoughts? have some 2SC536's on their way hoping this will solve the problem. if not. any ideas chaps, really am stumped as everyone elses seemed to work with 3904s. Sometimes it's easier just to rebuild than troubleshoot, man. Especially with smaller circuits like this. All the grounds need to be connected together. The simplest way would be to take the volume pot's lug 1 to right hand side bottom row of the board as that is a ground strip. The diode test function on your multimeter is good for this. Usually when you are getting the effect at a low volume, and the build is otherwise correct, the thing responsible is an unwanted short somewhere or more likely a poor solder joint somewhere. Reflow your solder, including the pots to make sure the connections are good. just breadboarded this and it works great! don't know what I did wrong the first time. did the mod between fuzz 1 and volume three. changes the sound completely! equally as awesome. also tried a 10k resistor in there and that sounded awesome but different. is there an easy way to wire up a pot as a variable resistor in its place so I can get a a scoop knob? have looked at a few things but when I use the Pot the way they say it just gives me the same sound as if they were directly connected with no change when turning the knob. ok managed the variable resistor, must have been connecting the wrong lugs. sounds awesome with the ability to change the scoop/fizz. will send a link to the video when its done processing. 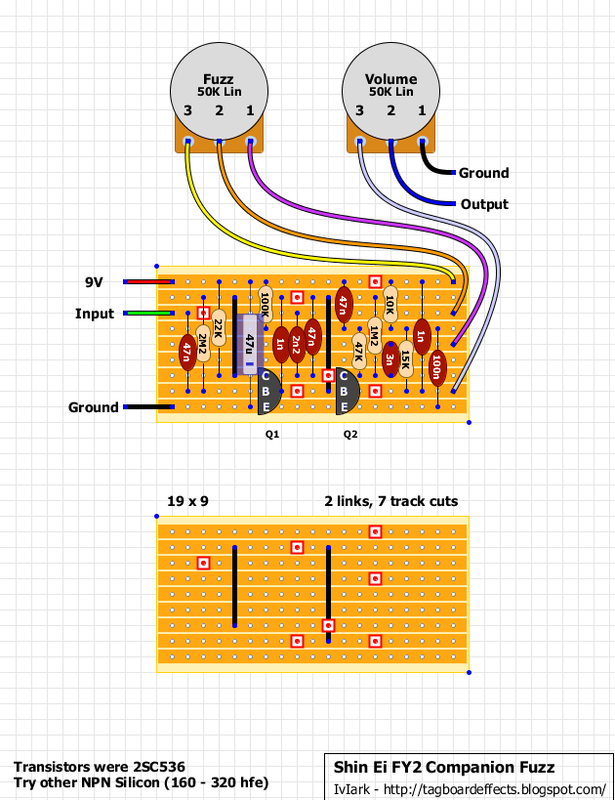 i read Thom's post about adding a pot in place of the 10k resistor to use as a scoop knob, but wanted to know do i do this? where do i need to make connections? what size pot? i'm looking at building this with a mid scoop and add a switchable booster too. 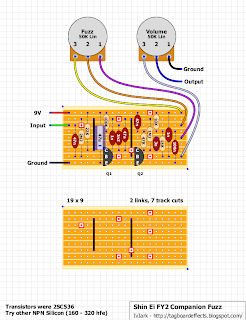 Used this layout and added a daughter board with the boost from the GGG schematic. Loud. Found 536 transistors in an old radio- they are super buzzy. I like BC108s too- less buzz & great bloom of sustained notes. Any chance of doing a vero layout for the FY6 Companion fuzz? I have a copy of the schematic, if it's of any use. Alan I think you have your FY-2's and FY-6's confused. The good news is the FY-6 already has a layout up on here under one of it's aliases - the Univox Super Fuzz. Thanks for that Beaker - it looks like quite a temperamental build! It's a big build, that's for sure. I built mine on PCB so not a problem. This is one build that may be worth getting a PCB for depending on your skill and/or confidence - especially if you intend to try to fit it into a 1590B. Hi, I built this one. It works fine. Thanks for the layout. I also wired lugs of fuzz 1 and volume 3 together. Sounds awesome. I understand you can leave the fuzz pot out by replacing them with resistors and add another pot as a scoop knob. But how would I do that? Could anyone help me out? i don't believe that, and going to call bs. the pictures of the pedals above clearly say Shin-ie on them and have , not to mention when i just searched "JACQUES PEDALS", not one pedal is even remotely similar to the Shin-ie Companion Fuzz in visual or circuit design. I put one of the guitar gadgets ones together years ago and it sounded like 8-bit crud so I threw it in a box. I pulled it out again the other day and suddenly it had so much more hair on it. It sounded amazing and became my favourite pedal. Somehow at some point it’s gone back to sounding like crud again. I know this is a punt in the dark but does anyone have any ideas on why this is? I build by pictures, can’t read schematics. I put the spdt between f1 and v3 as someone suggested above, but that only solved the perceived vol, it didn’t bring back that lovely fuzz hair... please help!